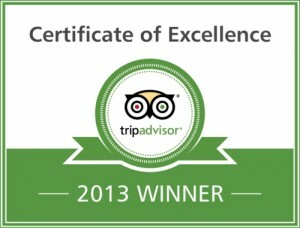 Nicuesa Rainforest Lodge awarded Certificate of Excellence 2013 by TripAdvisor. Playa Nicuesa Rainforest Lodge, a unique and transformational lodge & retreat center for wellness retreats of all types, located in the pristine tropical rainforest of southern Costa Rica, recently won the 2013 TripAdvisor Certificate of Excellence Award. The prestigious award celebrates hospitality excellence and is given only to establishments that consistently achieve outstanding traveler reviews on TripAdvisor.com, a travel review site. Only 10 percent of businesses on TripAdvisor earn the award, placing Playa Nicuesa's lodge & retreat-site offering in the upper echelon of hotels & retreat centers worldwide. 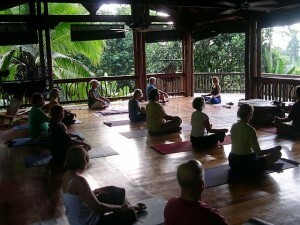 Playa Nicuesa Rainforest Lodge, situated in a 165 acre preserve in the Golfo Dulce/Osa Region of Costa Rica, has received praise and recognition in reviews by TripAdvisor travelers; particularly by those who have organized retreats there: â€œI was privileged to host a wonderful Yoga Vacation here. It was all, plus more, than I could have hoped for. Nobody left untouched by the experience.â€, claimed Cathy Daley, â€œAlive With Yogaâ€ retreat organizer from Sarasota, Florida. The lodge offers a unique adventure travel destination to host workshops related to yoga, meditation, and any other wellness areas. Workshop attendees are surrounded by the sounds of toucans, monkeys, and vibrant wildlife in the rainforest, along with the soft lull of the oceanâ€™s waves: â€œThe yoga platform is on the beach, beautifully situated, and the classes I had with our yoga teacher there touched me deeplyâ€ commented Ago; from Branford, CT who stayed on February 2013. Lodge is reachable only by boat, which assures the privacy required for a workshop to effectively inspire the spirit, creativity, and harmony of an eco-friendly and relaxed experience. To qualify for the Certificate of Excellence, businesses must maintain an overall rating of four or higher, out of a possible five, as reviewed by travelers on TripAdvisor. Reviewers rated Playa Nicuesa a 4.5 on average. Additional criteria include the volume of reviews received within the last 12 months. 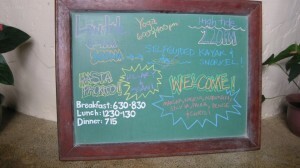 â€œA fabulous place to be in the Osa! Playa Nicuesa has it all, from lovely accommodations, gorgeous location, great food, great staff and so much to do in one of the most pristine places left on this planet! A real life changing experience. I am a yoga instructor and will be leading my 3rd yoga retreat at Nicuesa in February 2013!â€ MWYoga from Laguna Woods, California. Yoga group leaders, wellness centers or other workshop intermediaries can take advantage of the exclusive special rates Nicuesa Lodge offers to host workshops & retreats; which includes Tours, use of Lodge Facilities and Preserve, recreational equipment, three fabulous daily meals, and an excellent Guest-to-Staff ratio. As TCDaley expressed: â€œEverything about this place was wonderful... but the staff really made the biggest impression. I came away from this experience feeling, not only relaxed, but deeply inspired.â€ The lodge has extensive experience supporting the execution of wellness retreats, and our staff handles all operational details so that the organizer can focus on the marketing of their retreat and achievement of their own workshop goals. Interested retreat organizers are invited to visit the Nicuesa Lodge website for full details (http://Retreats.NicuesaLodge.com), and contact Playa Nicuesa Rainforest Lodge in order to obtain further information [call toll-free: 866-504-8116 or email: [email protected]]. Complimentary lodging for familiarization-trips is available for retreat organizers interested in viewing the site before scheduling their workshops at Nicuesa Lodge.